Outdoor Patio Lanterns can be beautiful as well as functional. Williamsburg Citronella Patio Lanterns allow you to attractively light your outdoor living spaces in the evenings while giving you a place to plant flowers that can be enjoyed throughout the entire day. By adding your favorite seasonal plants and annuals to the attached Planter, you can brighten any patio, deck, or porch even when the sun is shining. 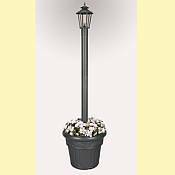 The Williamsburg Citronella Patio Lantern has an aluminum construction with a powder coated finish. Its easy to fill oil containers can use regular lamp oil or citronella liquid paraffin fuel for insect control. These Outdoor Patio Lanterns are manufactured by Patio Living Concepts, Inc. and come with a 1 year warranty protecting against defects in materials and workmanship. Each lamp comes with a fiberglass wick that will last a lifetime and you can choose between black or bronze textured finishes.